Belize NMS: Generally dry airflow over our area may become slightly moist at times today. Winds and seas will increase over coastal waters of the country tonight. 24-hour forecast: Sunny with a few cloudy spells today. Partly cloudy skies tonight and sunny skies with a few cloudy spells tomorrow. Showers will be isolated. Winds: East 10-20 knots becoming gusty tonight. Today: Winds: East 10-20 kt ; seas: Choppy - moderate ; waves: 3-5 ft ; an occasional shower or two. Tomorrow: Winds: E-SE 10-20 kt with occnl higher gusts ; seas: Moderate - rough ; waves: 4-7 ft ; mainly fair and dry. Marine Outlook: (Tuesday night) Winds: E-SE 10-20 kt with occnl higher gusts; seas: Moderate - rough; waves: 4-7 ft mainly fair and dry. General Outlook: For Tuesday and Tuesday night is for windy, warm and mostly dry weather. 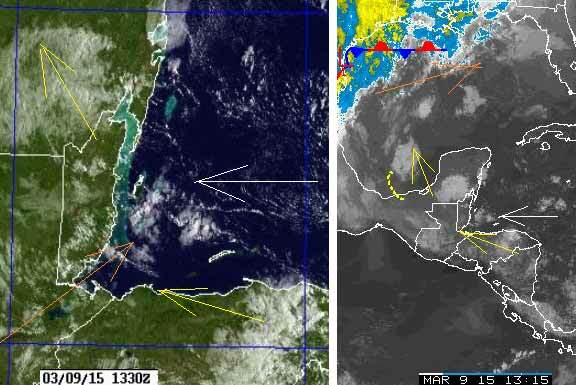 The Caribbean winds are again predominating, but when over land, producing large areas of cloud, and turning up northwards over Mexico. There is slight trace of the Pacific upper level winds, that, together with the mountains, causing those larger areas of cloud. There is more larger patches of cloud coming towards Belize from the ESE presently, which may bring some rain, as they did over night, not a lot, but some. I expect today will be mainly sunny, mainly small patches of cloud, but a few larger areas of cloud, and possibly a little rain.